To be fair, I've only ever had sticky rice one other time, and even that instance was just snagging it off a friend's plate at the end of a Thai meal we had in Los Angeles, circa ten years ago. After doing a little Google research, I stumbled upon this informative article that not only refreshed my memory about the fun Asian dessert, but also illuminated much about its history, origins, and typical methods of preparation. Among other things, I learned that sticky rice is also known as "glutinous rice," and despite the sound of the name, it does not contain gluten. This product does contain gluten, however, since there's a wheat-based covering on the spring roll. Not surprisingly, there's nothing about sticky rice spring rolls in that article, nor have I ever heard of such a thing before. But as Trader Joe's is well aware, just because something doesn't exist, doesn't mean it shouldn't exist. Enter: Trader Joe's Mango & Sticky Rice Spring Rolls. The photo on the box makes it look like the filling is mostly a mango-based jam-like substance. 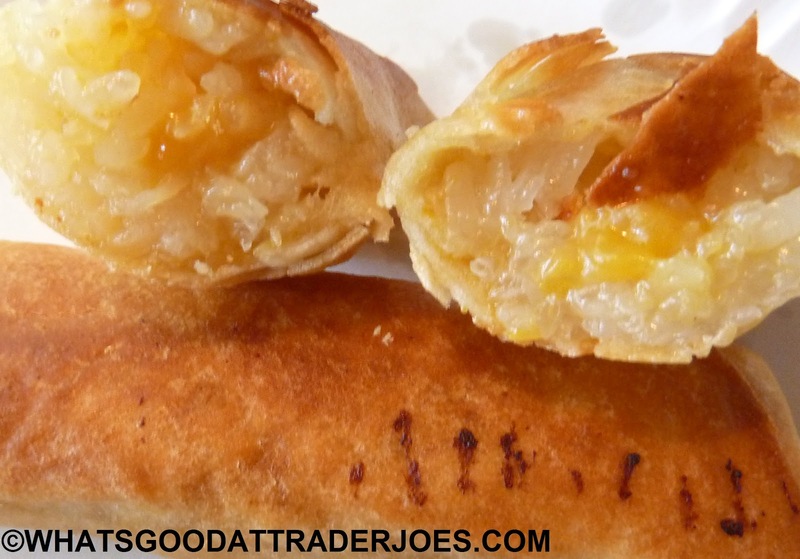 The filling is mostly sticky rice, but there's plenty of actual mango in there, too. And the mango gets slightly gelatinous, surrounded by all that yummy stickiness, but not to the point the cover art would have you believe. And that's just fine by me. There's plenty of authentic mango flavor as it is. The sticky rice is nice and sweet, and the "wrapper" on the spring roll gets warm and crispy when heated on a skillet with oil. While the spring roll version of sticky rice isn't necessarily traditional, it apparently is traditional to serve the sticky rice covered with coconut milk and mango, both of which are present here. It's a great combination, and I look forward to having it in its more traditional form next time I find myself at a decent Thai restaurant—or Laotian restaurant, should I be so fortunate. This dessert (or appetizer, as the case may be) is dense, heavy, and filling. The rolls are surprisingly structurally-sound, as they never completely disintegrated as I ate them with my hands. 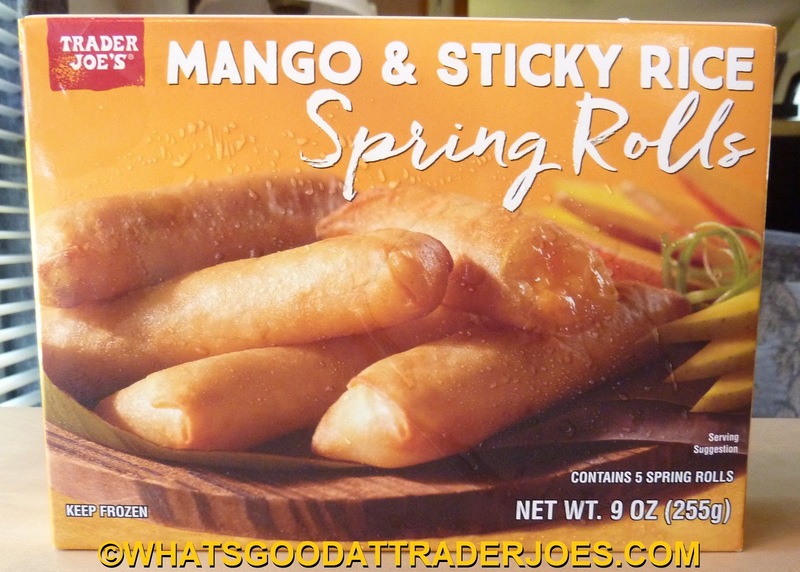 Even the mango pieces stayed right where they were supposed to, in the middle of the rolls. $2.99 for five rolls—more than enough dessert for two. I'd definitely consider purchasing this one again. It's got a great, unique flavor, quality ingredients, and it's easy enough to prepare. Double fours here. The employee at the DE TJ's said it must be brand new. I've certainly never seen it before. So good!!!! And good ingredients as well! Thank you! Trying them tonight!